Ideal for anyone who appreciates smartphone app service, support and timesavings. A fully digital home loan experience with a large variety of mortgage products. The Bottom Line: The online, mobile-first application tool, with on-demand support, that changed the industry. 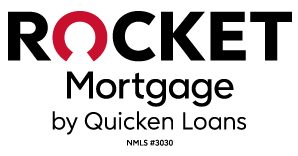 Rocket Mortgage is the online and mobile-friendly mortgage application process developed by Quicken Loans. With on-demand assistance from licensed mortgage advisors available with just a tap, Rocket helps you go through the loan process at your own pace. Compare Rocket Mortgage with other lenders. Rocket Mortgage was launched a couple of years ago in a blast of commercials touting push-button convenience at orbit-achieving speed. It was eye-catching and head-spinning. It certainly rocked the world of mortgage lenders, and it still leads the industry in loan technology. Everything in the Rocket Mortgage experience is about gradually and thoughtfully moving from one step to the next. It feels casual. Well, as casual as taking out a six-figure loan can. More than that though, the lender tries to anticipate user questions and have answers readily available. Rocket Mortgage has the loan lineup of typical non-bank lenders. Conventional loans and government-backed mortgages — like FHA, VA and USDA — are all available, for purchase or refinancing and with fixed or adjustable rates. Basically, it offers everything but home equity loans and home equity lines of credit. The reason most non-depository lenders don’t offer home equity loans or lines of credit is because they don’t have the capital from bank deposits to fund them. Non-bank lenders sell loans to investors, such as the government-sponsored enterprises Fannie Mae and Freddie Mac — which don’t buy home equity loan products. While Rocket doesn’t offer reverse mortgages, an affiliated company, One Reverse Mortgage, does. It all starts by clicking or tapping on one of the big "Refinance" or "Buy a Home" buttons. You provide the usual information to sign in. In the refinance channel, you choose a goal, such as “Lower your monthly payment,” and begin with essential details. When you enter your home address, Rocket pulls in publicly available data to pre-populate property information. Asset information, such as bank and investment accounts, can be downloaded directly from 98% of U.S. financial institutions. Rocket offers helpful tips and information along the way such as, "Clients who find their information online close six days faster, on average." Income and employment information can also be imported for about 60% of working Americans. Clicking on question mark icons throughout the application process will bring up relevant FAQ answers. Videos also help explain items as you go. 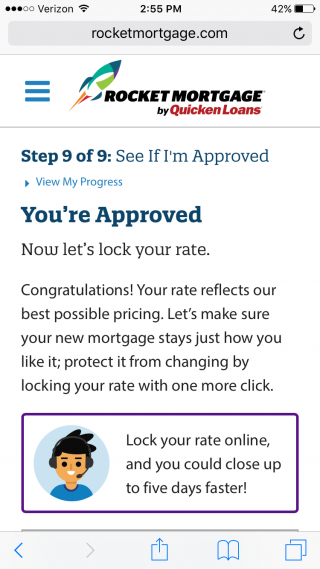 Tapping the "Talk to Us" button puts you in touch with a mortgage banker. A few more steps and within minutes you're at the "See solutions" stage. This is where Rocket Mortgage pulls your credit info, launches a "T-minus" countdown and reveals your loan choices. 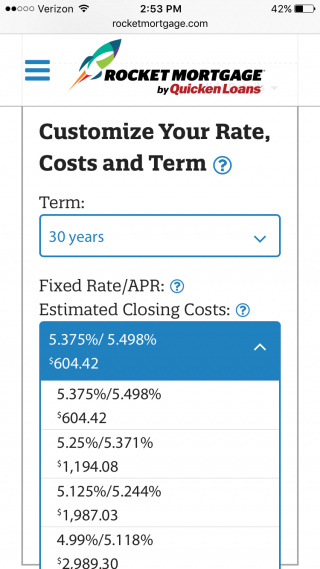 A pull-down menu allows you to customize your loan options. You can change the term, the money due at closing or your interest rate — or compare fixed- and adjustable-rate mortgages. Once you're satisfied with your loan choice, you tap on "See if I'm approved" and Rocket Mortgage verifies your qualifications and submits the application to an automated underwriting system. 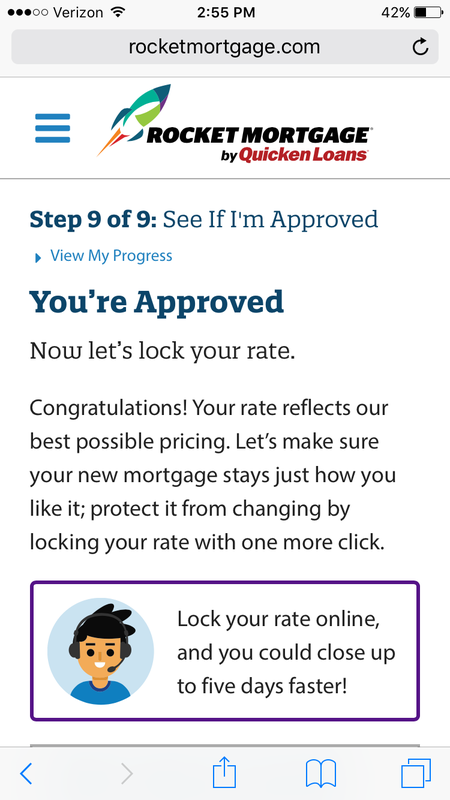 Upon approval, you can lock your loan rate. If you're purchasing a home, Rocket takes you through a similar process and provides you a preapproval letter — or, if you have a home under contract, submits an approved loan for processing through one of their mortgage bankers. A typical application takes about half an hour, according to Rocket Mortgage. But the point is to go at the pace you're most comfortable with. Once the loan is at the underwriting stage, what Hadiaris calls a "Facebook-style wall" is shared with you and your mortgage team to keep up with your to-do list, as well as manage and e-sign paperwork, monitor the progress of your loan processing, and even schedule your loan closing. Like with Quicken Loans, typical origination fees run around 0.50% of the loan amount. FHA, VA and USDA programs may have a slightly higher fee but won’t exceed 1% of the loan amount. Of course, this excludes discount points that you may decide to purchase in order to reduce your interest rate. If you’re trying to get an idea of what prevailing interest rates are, you won’t find sample national rates on the Rocket website. Instead, you have to create an account and provide some information to get a personalized rate.